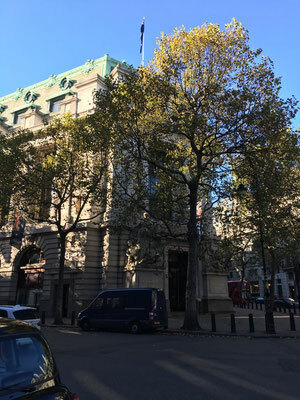 London is the perfect city for Harry Potter fans because not only the Harry Potter studios are located in London but also some of the most important film locations like Diagon Alley, Plattform 9 3/4, Gringotts, the visitor entrance of the ministry of magic and the headquarter of the orden of the phoenix. Check out this self-guided tour to explore these and other film locations in one day. Our tour to the most famous Harry Potter film locations in London starts at Leadenhall Market (closest tube station: Monument) because some of the outdoor shots of Diagon Alley were made. Maybe you recognized this market in the very first Harry Potter movie when Harry and Hagrid wanted to buy some school material for Harry´s first year in Hogwarts. Therefore, they have to go to the backyard of the Leaky Cauldron because there is a secret entrance to Diagon Alley. 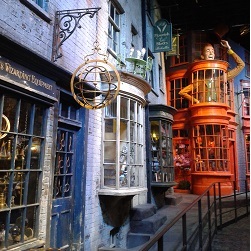 When touching some of the brick stones with a wand, the wall will open and you can enter the street. For the movie Harry Potter and the Philosopher's Stone an optician in the Bull’s Head Passage (at Leadenhall Market) were used as the entrance of the Leaky Cauldron. So do not miss that small passage. 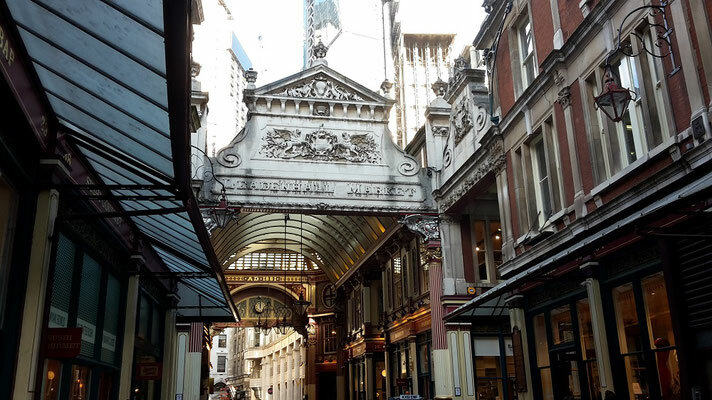 From Leadenhall Market it is approx. 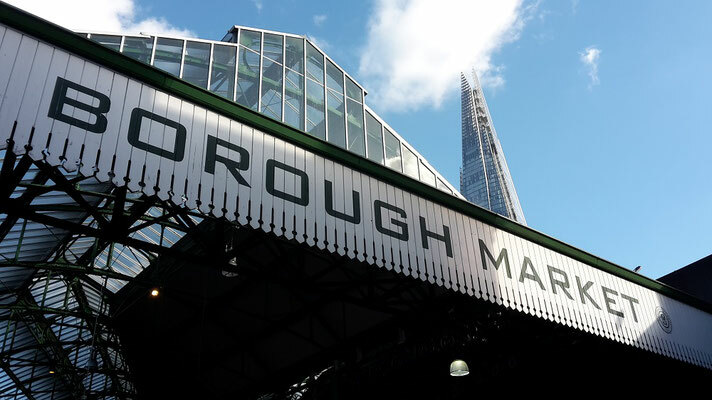 1.1 km / 15 minutes to Borough Market (via London Bridge). 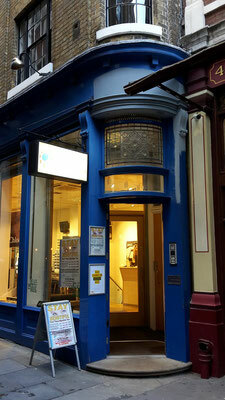 In Harry Potter and the Prisinor of Askaban the entrance of the Leaky Cauldron was relocated from Leadenhall Market to Borough Market (7 Stoney Street), to support the dark atmosphere of the movie. At the beginning of Harry Potter and the Half-Blood Prince the Millennium Bridge is destroyed by Death-Eaters. Maybe this is an allusion to the unsuccessful opening of the Millennium Bridge in 2000. Too many pedestrians made the bridge sway. Hence, it had to be closed again. After some time-consuming and expensive reconstruction works, the famous bridge could be finally opened. St Paul´s Cathedral can also be seen during this attack. Tipp: From the viewing plattform of Tate Modern you have a great view at the Millennium Bridge and St. Pauls. At St. Pauls there is a bus stop called St. Pauls Churchyard. 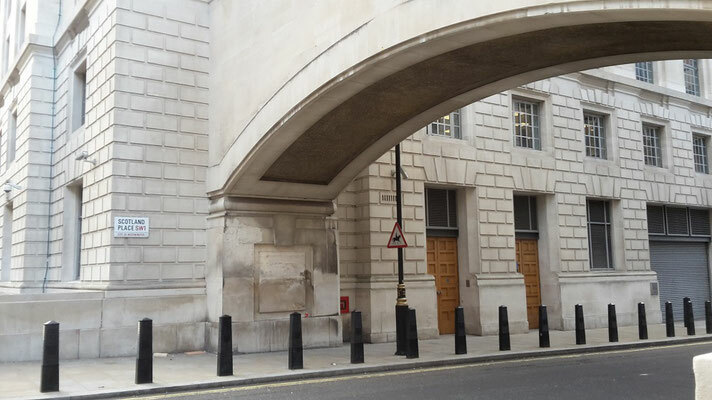 From this stop you can go by bus (15 / 23 / 26 / 76) to The Royal Courts of Justice (15 minutes). The stop is very close to the Australia House. 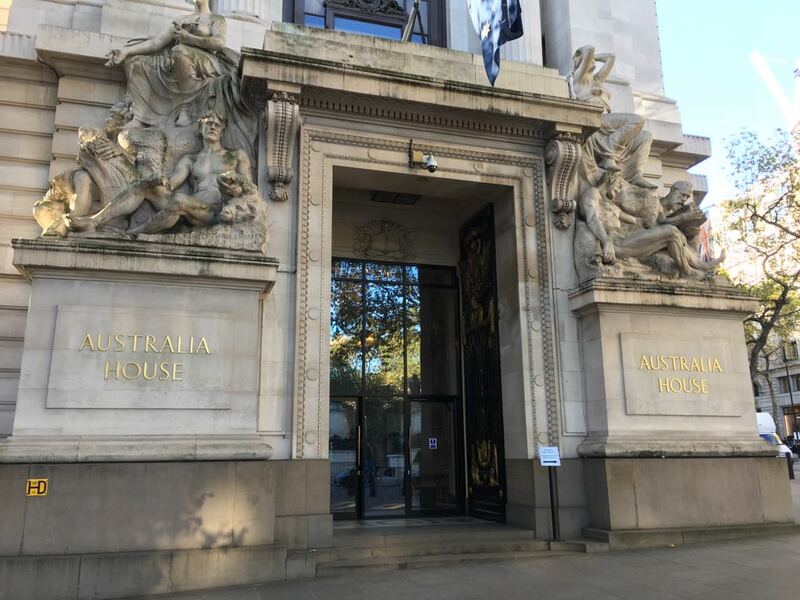 In the Australia House, the Australian embassy, scenes of the Wizarding Bank Gringotts were filmed. Unfortunately it is not possible to visit the house from the inside. Then walk approx. 1.3 km to Great Scotland Yard / Scotland Place (via the Strand, then turn left to Northumberland St, then turn right to Great Scotland Yard) or take the bus to Whitehall Trafalgar Square). 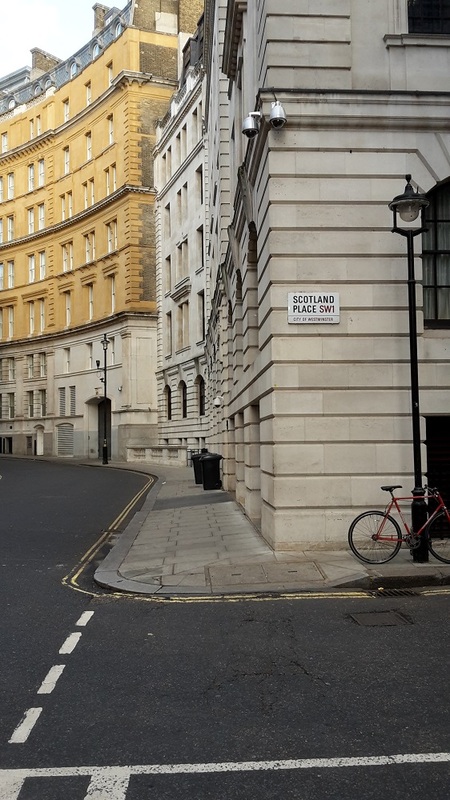 At Great Scotland Yard / Scotland Place there is the visitor entrance of the Ministry of Magic. Mr. Weasley and Harry used this entrance in Harry Potter and the Half-Blood Prince. The broken red phone box was just a movie prop and cannot be found there anymore. Otherwise we would have tried typing in the number 62442 (the numbers for the word magic) to see if the phone box turns into an elevator. Then walk to the Palace of Westminster (800 meter via Whitehall). The Palace of Westminster and the Westminster Bridge can be seen in Harry Potter and the Orden of the Phoenix when Harry and some members of the Orden flew over London on their broomsticks. Westminster Station was closed for one day for filming Harry Potter and the Orden of the Phoenix. You can see the station when Mr. Weasley and Harry took the tube to go to Harry´s hearing at the Ministry of Magic. Because Mr. Weasley travelled like this for the first time, he did not know how to pass the electronical barrier. Nevertheless, they made it to Harry´s hearing in time. From Westminster Station take the Jubilee Line to Green Park (one stop) and then the Piccadilly Line to Piccadilly Circus (one stop). You can also take the bus from Parliament Square to Regent Street. Both takes approx. 10 minutes. (walking time is 20 minutes; 1.2 km). 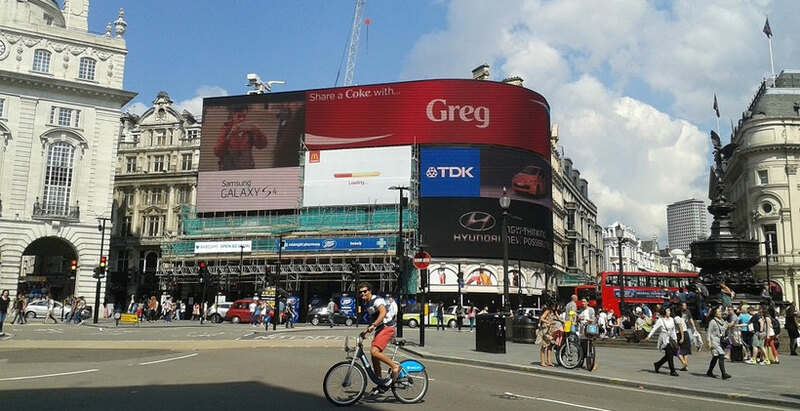 One of the most famous squares in London, Piccadilly Circus, was used as a filming location for Harry Potter and the Deathly Hallows part 1 when Harry, Ron and Hermine disapparated from Bill and Fleurs wedding. They arrived at Shaftesbury Avenue and then walked through the Westend. When drinking a coffee in a cafes they were attacted by two death-eaters. Then take the Bakerloo Line (4 stops) to Marylebone Station and then the bus from Dorset Square Marylebone Station to London Zoo. In Harry Potter and the Philosopher´s Stone Harry found out that he can speak to snakes at the reptile house at London Zoo. Accidentally he freed the Boa Constrictor and put his cousin Dudley into the terrarium instead. Adults pay £20.45 (online) or £22.73 at the entrance. 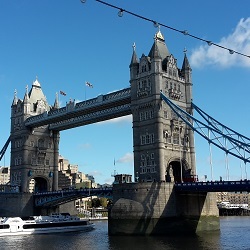 The zoo opens daily at 10 a.m. and closes depending on the season between 4 p.m. and 6 p.m.
Then go back to Baker Street Station and take the Circle or Hammersmith Line to King´s Cross. 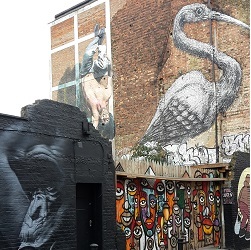 As an alternative, walk to Camden Town station (1.2 km) and take the Northern Line to King´s Cross. If you want to discover the whole zoo, you should probably go there on a separate day. 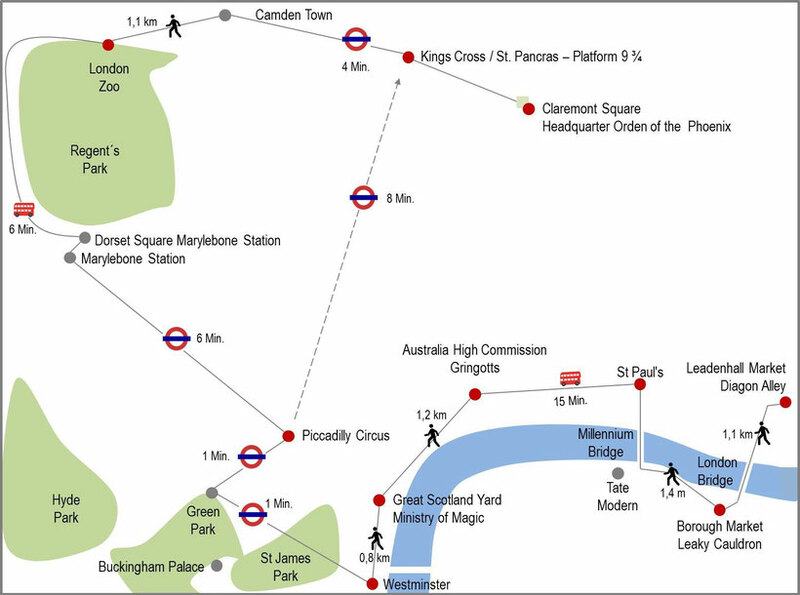 Then go by Tube (Piccadilly Line; 5 stops) directly from Piccadilly Circus to King´s Cross. Every year when the students go to school by Hogwarts Express they have to enter plattform 9 ¾ at Kings Cross. In the station hall also Muggle will find the plattform today or at least a sign saying "Platform 9 ¾" and a luggage card which is about to disappear in the wall. (You can only go to the real plattforms with a valid train ticket.) 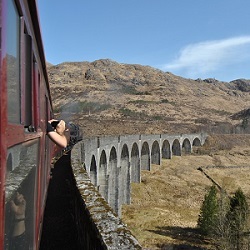 Here you can make some souvenir photos wearing a Hogward´s scarf. Also in the hall: a Harry Potter fan shop. The platforms can only be entered with a valid ticket. 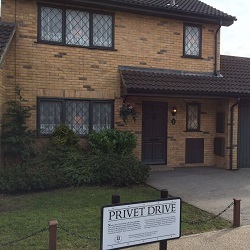 Then you will find a sign saying "Platform 9 ¾" and the luggage card also there. Did you know that for filming Platform 9 ¾ the platforms 4 and 5 were used? Next to the building is the railway station St. Pancras. In Harry Potter and the Chamber of Secrets you can see Harry and Ron flying to Hogwarts with Mr. Weasley´s flying Ford because they missed the train. When arriving at Hogwarts the car disappeared in the forbidden forest. Later on Ron got a howler from his mum but at least the car saved Harry´s and Ron´s life when they had to escape from Aragog and the other spiders. 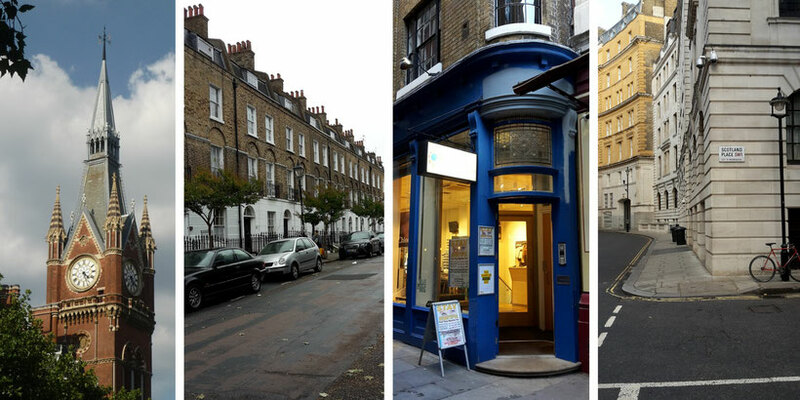 Then go by bus to Penton Street, which is close to Claremont Square. 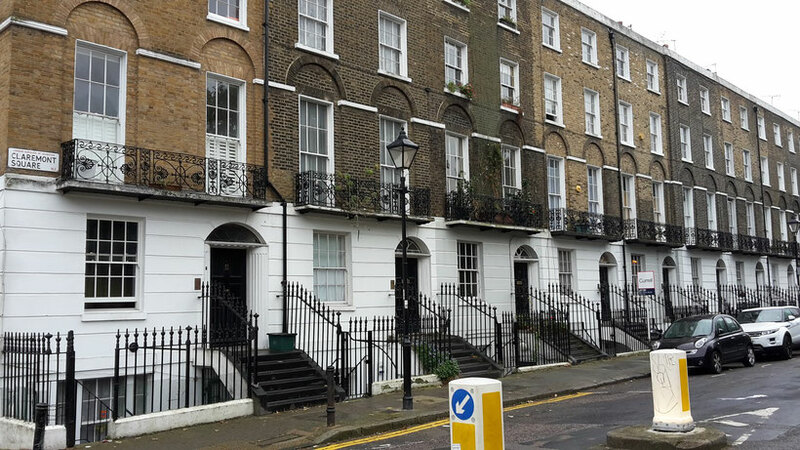 In Harry Potter and the Orden of the Phoenix the houses at Claremont Square were used to film the headquarter of the Orden at Grimmauld Place 12. Feel free to safe this map on Pinterest! I love the way you laid this out. I would love to spend a day doing this tour. 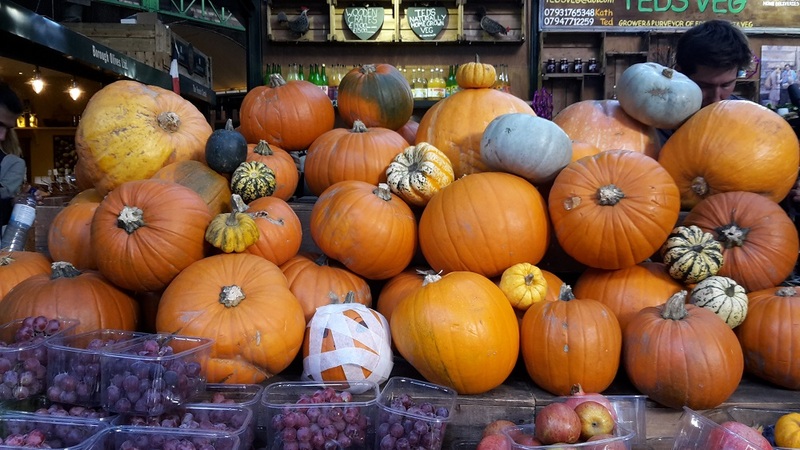 This is a great self walking tour for every Harry Potter fan traveling to London. I have seen quite a few of these spots during my trips to the capital and it's always nice to pass by and think that you're in Harry's world for a few seconds.